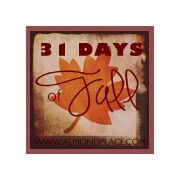 Almond Place: 31 DAYS OF FALL: Welcome! 31 DAYS OF FALL: Welcome! Welcome to Almond Place! I am so happy you're here! I am celebrating my favourite season in my 31 Days Series. I'll be crafting, and cooking, and taking lots of pictures! A little about me for my new friends: I'm Mandy...age 32...married to J for almost 6 years...have 3 kids: Andrew (4), Jacob (3) and Grace (3.5mos). I am Canadian but live in Arizona for now...."for now" once meant a couple of years...those years have turned into a decade. My personal motto is: BE INTENTIONAL. It's what drives me, it's what helps me refocus, and it's what helps me realize my purpose. I can't wait to celebrate Fall with you! Please grab a button and follow me! Click HERE to find all of the rest of the posts in one spot or Click onto DAY 2 to head to the next post! I just came over from the 31-dayers. I love the fall, too. It's far and away my favorite season!